«©NCSX» With a bounty of FFX-2 merchandise and accessories already announced and/or shipping to market, Japanese manufacturer Cafereo adds to the truck with a new 2003 (April 2003 to March 2004) calendar plastered with pictures of the FFX-2 players. 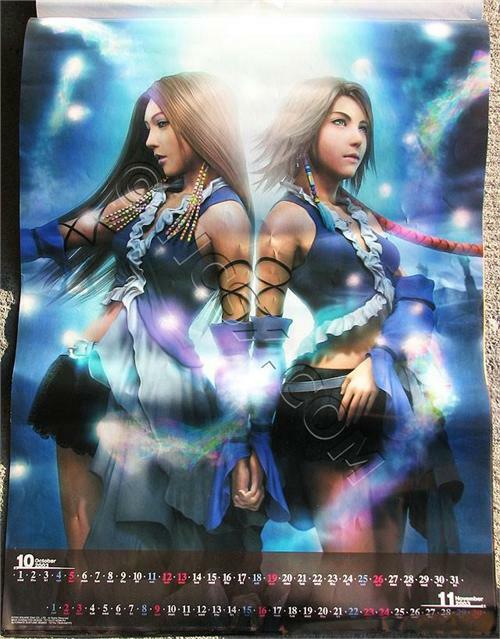 Spend an entire year with the girls of Final Fantasy X-2 by hanging this poster-page sized calendar (measuring 29.5 x 20.5") on your wall or in your hall. There are seven pages total - one cover sheet and six monthly pages in the calendar. After every two months, you'll have a new poster to look at as the year winds down. Since the pages of the calendar are poster quality, one may remove expired pages from the calendar and hang them separately to color your walls, ornately frame them or place the posters in hermetically sealed mylar for your FFX-2 shrine/archive. Pricing is set at US$18.90 per FFX-2 2003-2004 Calendar. Square's Dissidia game was a sales success in Japan but NCS expected a lot more tie-in merchandising. The original DVD version of FFVII Advent Children was released in September 2005 and NCS recalls the wonderment in the room as we watched Cloud and company emote, attack, and act with a realistic semblance of humanity.